I would like to state for the record that I am a little bit of a picky eater. I try not to make a big deal out of it, and I just try to be quiet and polite so no one gets offended. It's not their fault I have picky tastebuds. 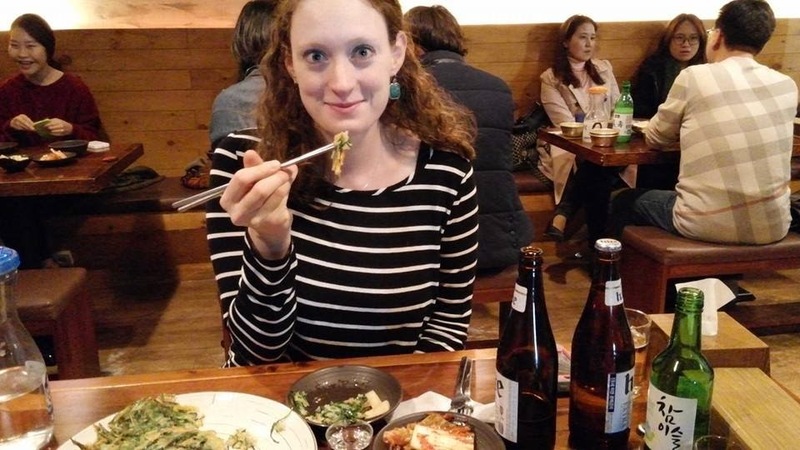 We ate out often in South Korea. Some of the things I really like and other things I didn't. We got invited over for a family dinner the Friday night I was there and the hostess, who was Korean, made a traditional Korean BBQ spread. It was a smorgasbord of fun. I enjoyed that meal a lot because there was bread and salad and fruit and lots of different choices where I knew what they were. I really liked their soju (see below). A vodka-like rice liquor, this clear liquid is 19% proof. Oye! You pair it with a South Korean beer, which, one its own is just AWFUL. We drank Hite, that was the most common brand I remember seeing. So you fill up your beer glass leaving about two inches at the top and then pour a shot glass full of soju into the beer. It gets a little bubbly and then it tastes like magic. And holy smokes can it knock you for a loop if you aren't careful and watching how much you drink. My cheeks were on FIRE when I drank (I usually flush when I drink more than two drinks). I tried kimchi, a spicy cabbage dish very popular in South Korea. It doesn't look like the most appetizing thing (see below), but it wasn't bad. Definitely different spices than I was used to. Eating meat in a different country makes me wary (I have these weird things...I know). So I was really hesitant to go all out and trust that my stomach would hold strong. This is like a veggie pancake made out of potatoes, sweet potatoes and then a lot of greens. It actually wasn't bad. I had to get proof for my dad I ate my entire meal with chopsticks. I wasn't very good at it, but I was determined not to use a fork. There are a lot of seafood, pork and chicken dishes. We also saw possum on the menu. I mean that's not weird, people in the South eat possum, but I'm pretty sure this meat was advertised as being on a pizza. I thought there would be more noodle and rice varieties, no big deal. They do have fantastic bakeries and coffee shops in South Korea. Any time I ate bread, it was like I was biting into a fluffy, warm cloud of gluten. Delicious! The coffee made my veins sing. It was so good. I still can't pinpoint what made it taste so good, but it did! And of course, I usually don't discriminate when it comes to desserts. 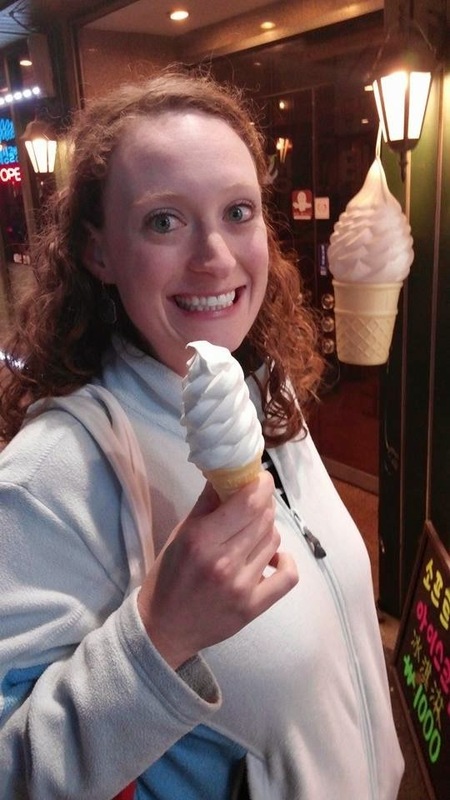 This ice cream cone I got for .90 was an culinary explosion on my taste buds. 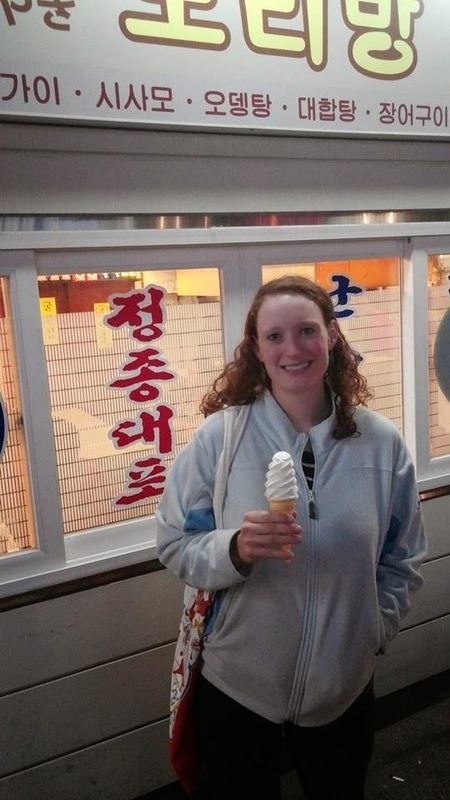 Eating in South Korea was an experience for me. I know Jeff probably wished I was more adventurous in my eating, but I tried my hardest while still being mindful of my stomach. I wasn't overly crazy about the Korean food, BUT you have to take what I say with a grain of salt because I'm just one person. And a person who is picky at that. If my brother were to travel over to South Korea he would probably have loved everything he ate, its just the perspective and the tastes of the person. 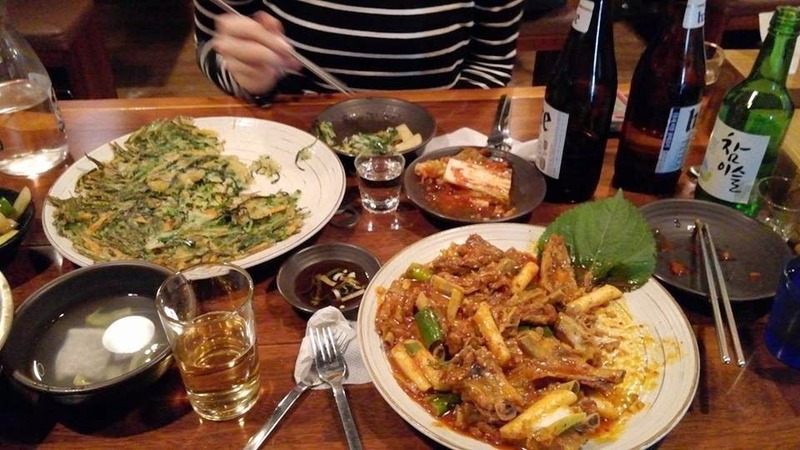 I will say that the South Korean eating experience will leave you with the impression of gracious hosts who give you your space to eat and enjoy. They definitely don't hover or imply that they need to get you out so they can fill your table with the next customer. They expect you to stay and enjoy yourself for an hour or more. I liked that. I never felt rushed or uncomfortable while eating. You are braver than I would have been. And FOR THE RECORD, I am born and bred in the south. I know NO ONE who eat possum. Maybe in some backwoods places where they are starving to death, like in Mississippi. I don't know. But that line made me laugh out loud. Good post!